Exposure X3 is a great all-in-one image browsing, editing and enhancement tool. 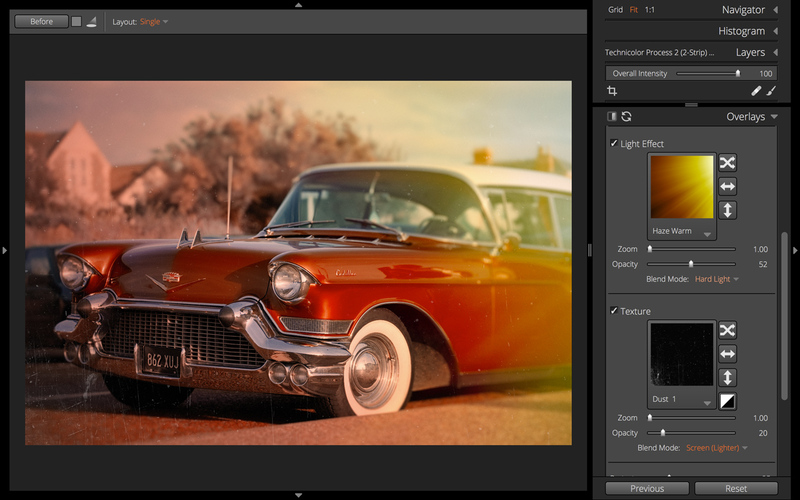 Its strong points are a no-nonsense workspace and a large library of preset image styles and treatments which reflect old-style analog photography as well as embracing regular mainstream digital adjustments. It’s designed for enhancing single images – it doesn’t support multiple image layers – but it does it with a finesse and sympathy which will endear it to fans of subtler image effects, and its latest Complete Workflow Update brings some useful improvements. Alien Skin Exposure X3 is the latest version of its all in one photo cataloguing, editing, enhancement and effects software. 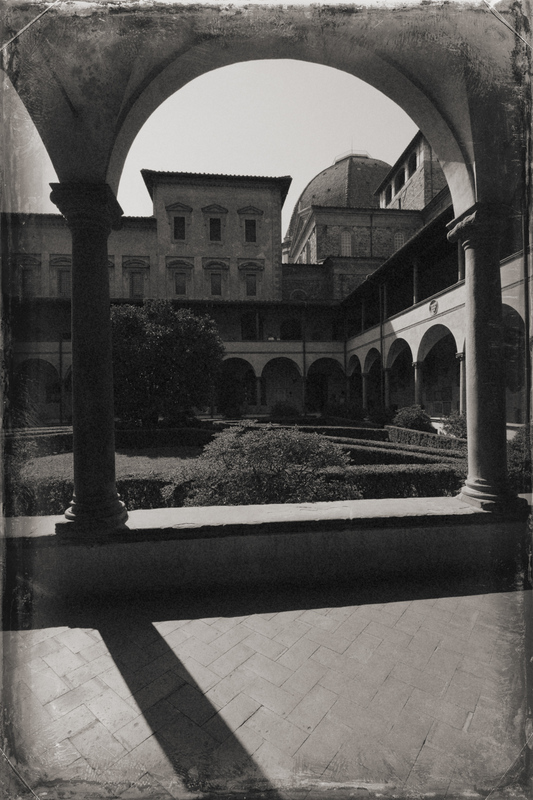 It’s designed not just to provide everyday photo enhancements, but also to recreate the powerful and evocative look of classic analog photography, simulating classic films and darkroom techniques, as well as grain, vignettes, textures, borders and light leaks. It can also work as a plug-in for Photoshop and Lightroom, but it’s in the standalone app’s organisation tools that Alien Skin has made some of its biggest strides, and for some this will make it a very effective alternative to programs like Lightroom and Photoshop, especially those who like the relative simplicity of a folder-based image organising system and who want to enhance single images rather than make multi-layer composites. At heart, Exposure X3 offers simple folder browsing tools, with a Folders panel that shows the folder hierarchy on your computer and displays thumbnail images of the images inside each folder. There is no Import process as such (one of the main complaints about the complexity of Lightroom) but you do have to manually add the folders you want to see. It’s a one-time process that saves you cluttering up the Folders panel with every single directory on your computer, and folders you add are automatically scanned and update with any new images each time you open them. But Exposure X3 can also search across all your folders, and display the contents of sub-folders too, lifting it beyond the limitations of most regular photo browsing tools. Matching images are still displayed within the folders they’re stored in, but it’s a quick and simple way of finding pictures across a large image library. There’s more. Exposure X3 also offers ‘collections’. These are like the Collections in Lightroom and Albums in other programs. Collections are a way of gathering together related images ‘virtually’ without changing their location in the folders on your hard disk. This is a great feature to have in a program that’s still essentially a straightforward folder browsing tool – you get many of the advantages of an image cataloguing system but without having to import your images into a catalog. 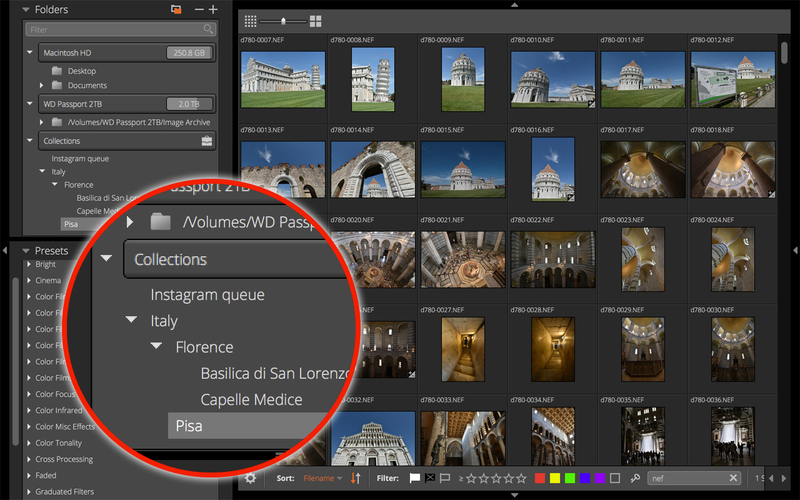 The latest Complete Workflow Update automatically creates a new collection for images you import from a memory cards, so that you can find them easily again afterwards. You can store your photos in ‘virtual’ Collections, and these can be arranged in a hierarchical system. Exposure X3 doesn’t offer smart collections yet, where the collections are displayed according to chosen search criteria, but that’s no doubt on Alien Skin’s radar. You can arrange collections into a hierarchical filing system, though, rather than storing them as one long linear list. Exposure X3 introduced support for keywords, which had been a bit of an omission up until then. This makes it much easier to search for images within folders, collections and across your whole image library. You can choose whether or not keywords are embedded when you export image files and, like collections, keywords can be arranged into a hierarchical system. The Exposure X3 Complete Workflow Update offers improved keyword support, with the ability to remove keywords from images, add and remove them from ‘keyword sets’ and to import keywords from other programs. With new Virtual Copies and side by side display mode, you can create and compare multiple versions of the same image without using up any more disk space. Exposure X3 also makes it easier to review and cull your images straight after a shoot, using its side-by-side display modes. Many image browsers let you compare a selection of similar images side by side so that you can select the best, but Exposure X3’s implementation is typically thorough. Exposure X3 allowed a maximum of four images at a time, but the Complete Workflow Update takes this up to six. This is a useful and flexible feature – when you zoom in and pan to check for details, for example, all of the images zoom and move in unison. 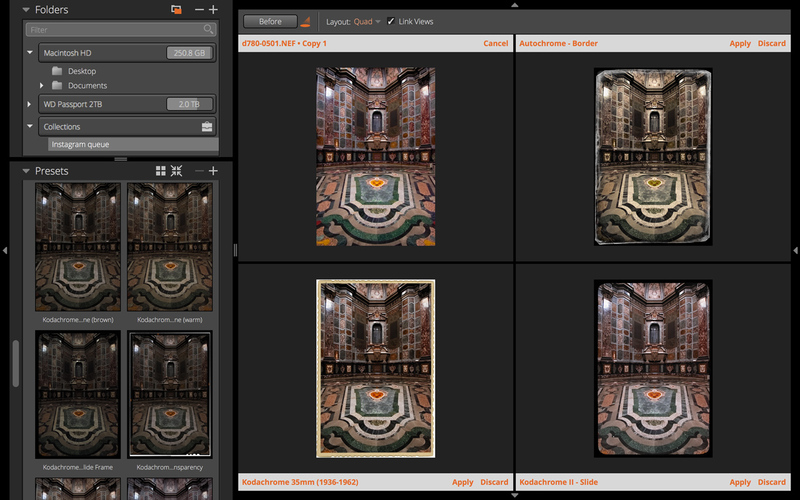 And you can ‘pin’ your favourite image and then choose others from the filmstrip to compare it to. 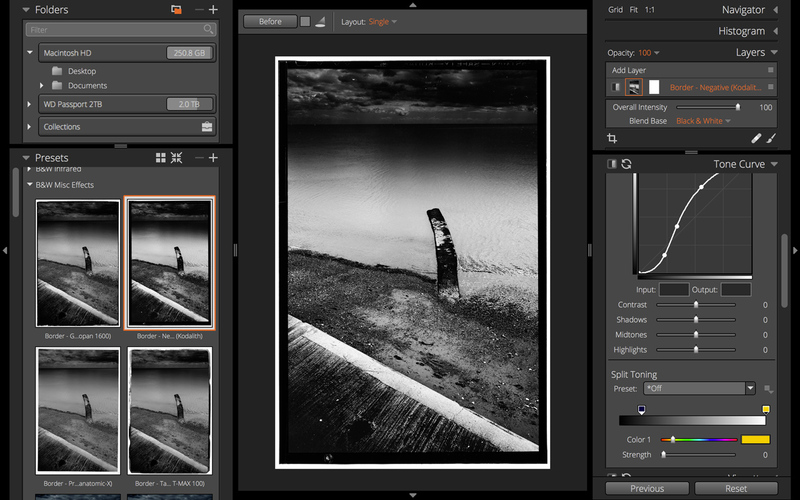 Exposure X3 combines two types of editing in one. You can use it for regular image adjustments like curves, exposure, contrast, white balance, clarity and more – the white balance panel has been improved to show the temperature and tint values embedded in RAW files – and you can create complex localised adjustments using its system of adjustment layers and masks. New in the Exposure X3 Complete Workflow Update is a set of controls for adjusting the Hue, Saturation and Luminance (HSL values) of individual colour ranges. This is an especially effective way of creating subtly crafted colour ‘looks’ or tweaking specific colours without applying a global correction. Exposure X3’s other editing persona is its rendition of creative analog film effects via a large collection of effects presets and/or manual adjustments applied via its tools panels. You can create bokeh (defocus/blur) effects, film grain, light leaks, textures and borders. The ideal starting point for your experiments is the Presets panel, and Exposure X3 has a clever tool to help you decide which preset works best – you can ‘audition’ up to four different presets at a time. This means you can compare effects directly before committing to one or the other, instead of using the old method which was to select an effect, undo it if you didn’t like it and try another – hoping you can remember the first well enough to make a proper comparison. Not sure what preset effect to use? Now you can ‘audition’ up to four at a time before deciding. This is actually a really clever idea that can save a lot of trial and error. It makes it easier to try out Exposure X3’s great range of preset image effects, which are right at the heart of this program’s power. And this goes a step further with Virtual Copies. One of the key points about Exposure X3’s adjustments is that they are non-destructive. Your changes are simply stored as processing ‘instructions’, and they are only applied permanently to an image if you Export a new, edited version. So with Virtual Copies, you can try out a new version of a photo without creating a new file and gobbling up space on your computer. Instead, the adjustments are saved as processing metadata rather than as a new image. You can create as many Virtual Copies as you like from one photo to produce multiple artistic interpretations of the same image. These Virtual Copies work in just the same way as your original images and you can apply all the same tools. Exposure X3 uses a system of internal adjustment layers to apply effects and local adjustments cumulatively, using layer masks which can be made with simple freehand brush tool or with controllable radial and linear mask tools. You can quickly tone down bright skies, lighten dark foregrounds and create precise vignette and ‘relighting’ effects, as well as applying more hand-crafted dodge and burn adjustments to specific image areas. Many local adjustments can be carried out simply and quickly with the radial and gradient masking tools. With many of these features you might argue that Exposure X3 is simply playing catchup with programs like Lightroom and Capture One, but don’t forget this is not a professional cataloguing program, it’s a creative, artistic effects tool first and foremost, so its new organisational abilities in particular go above and beyond what you might expect. You can create dense, powerful black and white images using a combination of classic film simulations – this one is Kodak Lith film – with localised manual adjustments. Exposure X3 runs pretty well on my modestly-specced MacBook Pro. Image browsing is fast and image effects render quickly. I did run into split-second lag on some sliders with more complex effects, but nothing too irksome. You can work directly on RAW files, too. Exposure X3 uses automatic lens correction profiles behind the scenes to straighten out lens distortion, and there are manual controls if there’s no profile for your lens. The Complete Workflow Update adds RAW support for a number of Fujifilm cameras, including the XH1, as well as lens profiles for new lenses from a number of different brands. I am quite picky about RAWs, though, so I’d probably do my RAW conversions elsewhere anyway, but that’s just me. Certainly, being able to edit RAW files directly is useful, especially for localised adjustments, because you can recover highlight, shadow or colour information simply not present in JPEGs. If you’re keen to extract the maximum possible quality from your RAW files, though, my feeling is that Capture One Pro, DxO Photolab and Lightroom/Adobe Camera Raw offer better dynamic range recovery, sharpness and noise control. The localised adjustment tools do work very well in conjunction with the extra dynamic range and colour information available in RAW files, though. Exposure X3 doesn’t have the powerful dynamic range controls of Lightroom or Capture One Pro, but local adjustments are a perfectly good alternative and can encourage you to do the ‘right’ adjustments for each image rather than relying on indiscriminate global adjustments. There still are a couple more things it would be good to have, such as perspective adjustments, the ability to stack and group images and maybe a cloud synchronisation and mobile app – but it’s easy to get sucked into wanting more and more when this software already does so much. On the subject of cloud syncing, though, Exposure X3 has one very useful feature – it saves all its adjustments as metadata files inside a folder alongside your original images, and not in a centralised library file. This means that you or someone else can view your images on Dropbox, Google drive or iCloud drive on another machine, running another installation of Exposure X3, and see exactly the same adjustments. For the record, this image was created with Exposure X3’s vintage Technicolor effect with the addition of an elliptical bokeh effect, a light effect from the right edge, some dust and scratches and a subtle warm-up filter. Alien Skin Exposure X3 has come a long, long way from its origins as an analog effects plug-in. The addition of standalone capability and now quite powerful image organising tools mean you could use this software for your complete end-to-end workflow. Many enthusiasts and professionals don’t need the database-driven cataloguing systems of Lightroom and Capture One Pro and are happier with the more easily understood folder-based filing system used here – especially since users now get the advantages of Collections and Virtual Copies. Exposure X3’s effects are beautiful and varied, and its approach is subtler and less frenetic than some. There are no wildly exaggerated HDR looks or over-the-top colour manipulations here, thank goodness. There are certainly cheaper all-in-one tools than this one, but Exposure X3 has a breadth, a clean efficiency and a ‘class’ that makes it feel well worth the money. Alien Skin Exposure X3 Complete Workflow Update is available to buy now from the alienskin.com website for $149, or $99 if you’re upgrading from a previous version. There’s also a 30-day free trial. I bought Exposure X3 about three days into the free trial. I was so happy with the clean interface and the lack of a cumbersome cataloging process like Capture One Express (for Sony). 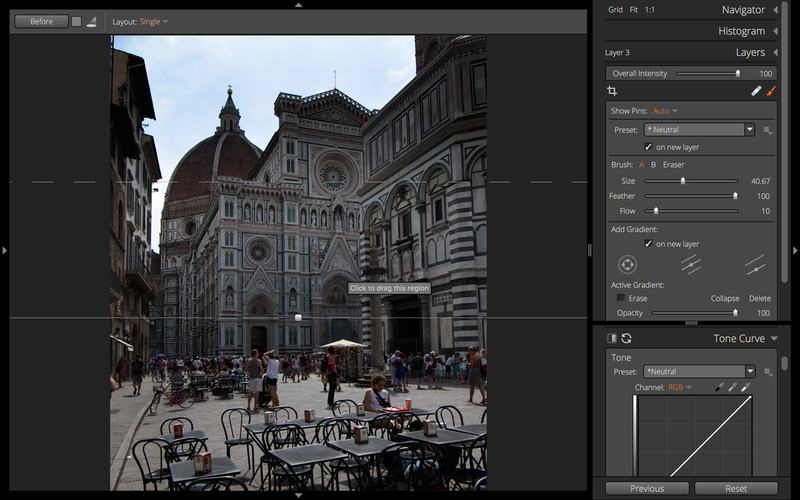 I prefer the RAW file outputs from Capture One, although Exposure X3 does a fine job on images without exposure extremes. I will have to experiment with their local adjustments features you menioned. How does Dx0 PhotoLab compare to Exposure X3 for RAW conversions, in terms of ease of use and output? Thanks for your great articles. I’m glad I found Life After Photoshop. 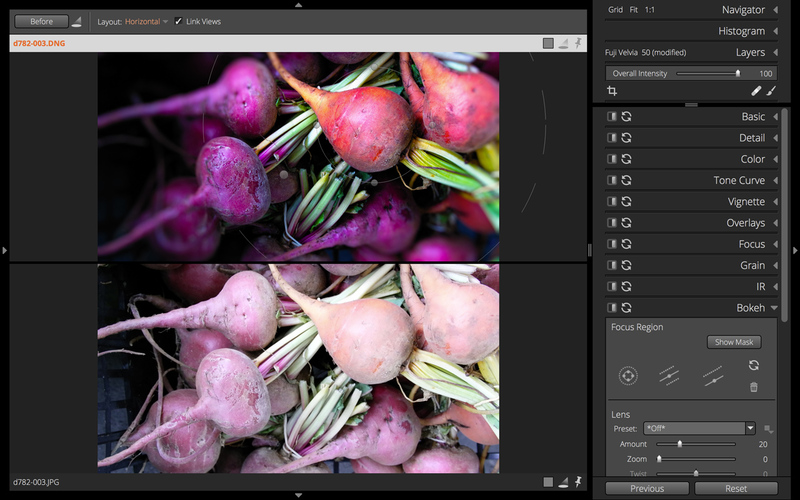 Currently, I think DxO PhotoLab’s RAW conversion are the best of all, provided it supports your camera, though it’s a close-run thing with Capture One, which I find yields stronger colours and better dynamic range control in some instances. Thanks a bunch Rod, I appreciate your feedback, articles and website! I just pulled up an image that I had trouble editing on Exposure X3 in PhotoLab and there was a big difference in quality. Everything looked good on Exposure X3 except I could not pull detail out of the shadows, but PhotoLab pulled out shadows within a minute of opening the browser for the first time. I like Alien Skin’s screen layout better, but oh well, I think I’ll be using PhotoLab for almost everything from now on but I will keep and use both from time to time. I had been thinking of DXO until I realized it does not support Fuji X sensors. Fuji has the xtrans sensor array which is different than the standard bayer and DXO only supports the standard Bayer. I have DXOphotolab for lumix G9 and Olympus. The conversion is superlative especially if you have the film pack. 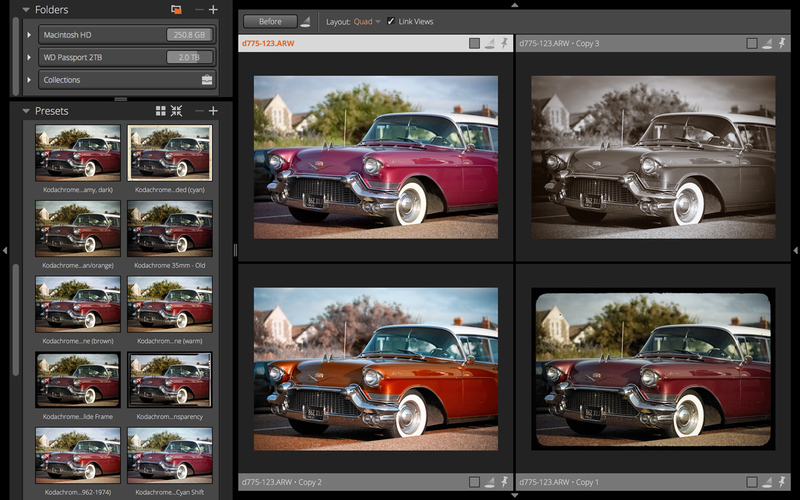 I suspect the nik plugins will be integrated into photolab which will make the workflow complete for me. Anything else that needs layers, I use Affinity photo . I have on1raw 2018 and exposure X3 for cataloging / manipulating TIFFS or jpegs exported from DXOphotolabs. For fuji film, I use Xtansformer for $30 to convert fuji raw to DNG, which is arguably one of the best raw converters for Xtrans sensor. Though this sounds like numerous options and sort of a schizophrenic workflow, I have found that, depending on the shoot, its mostly one click processing of multiple images and saves me a ton of time sans subscription based adobe model and also less expensive. i should metion that I do have X3 and use it in conjunction with the the Dxo Nik Apps and Lightroom CC Classic and Mobile. Wish they had a syncing mobile app to go with it. Regarding Sharpening compared with Lr, I also thought it was rather weak, but note that X3 has TWO sharpening tools, one in Detail, which appears to be a very subtle capture sharpener (as Aperture had), and one in Focus, which appears to be an output sharpener, to be used very sparingly… together, they match anything Lr can do. But for my main cameras (Olympus m4/3, actually X3 delivers a better Raw conversion for my tastes. It is very neutral, but very “luminous”. In comparison all of Lr’s profiles are over saturated and try too hard to please. X3 gives me a great starting point. If only X3 had geometry correction…. I might even waver from my commitment to Lr as my principal tool.